Below is a video that has been making its way around the web. If you haven’t yet seen it, prepare yourself to be amazed.Â What you will see within is a 73 year old man (Anatoliy Nikitovich) whose abilities would humble most healthy adults a fraction of his age. I’m sure I speak for many in saying that I hope to perform at his level if and when I reach that age. As for the video itself, I enjoyed it for several reasons. First, it is obvious that this man is extremely capable despite training at a gym that consists of nothing but outdoor bars. If there was ever a case for the potential of a low-tech environment, Anatoliy should certainly be included in the discussion. It is also nice to be reminded that bodyweight exercise is available to all. Anyone can head to a local playground and train from the bars. Calisthenics were never intended to be expensive to learn or perform. Unfortunately, it seems like every week there is a new bodyweight exercise certification being pimped to the masses. 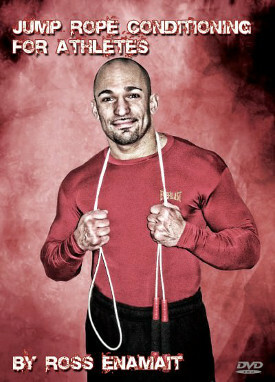 I have seen several bodyweight seminars and certifications marketed for hundreds of dollars (even more in some cases). And while I have nothing against earning a living and providing quality instruction, charging such outrageous prices defeats the purpose of making calisthenics available to all. It shouldn’t be necessary that you refinance your home to learn how to effectively perform bodyweight exercise. It is safe to assume that Anatoliy did not develop his strength at a weekend seminar. Instead, he is the product years of intense dedication and effort. Fortunately, such attributes are free to all. You can’t purchase effort and dedication. Even the savviest marketers haven’t figured out how to sell these intangibles. You will be hard pressed to find many senior citizens who are as capable as Anatoliy Nikitovich. Don’t just be inspired by his example however, learn from his as well. For instance, don’t confuse calisthenics with rocket science. Working with your body isn’t nearly as complicated as many would like you to believe. With a little creativity, you can exercise anywhere. 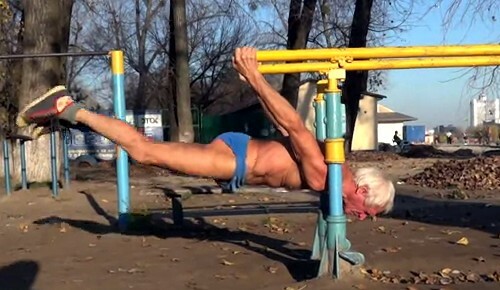 Anatoliy trains at an outdoor gym that is available to all. It consists of nothing but bars. Anyone can go there to train. There are no secrets to his success. He shows up regularly and has done so for years. It is amazing what can be accomplished with a consistent and diligent effort. The sooner more people realize this simple fact, the better off we’ll all be. In summary, don’t be blinded by the industry’s hype. Keep it simple, work hard, and remain consistent. Those are the only training secrets that you will ever need. What I think also would be incredible would be for cities all across the USA to install in our parks, outdoor gyms such as this. Doesn’t have to have a high bar or rings (wouldn’t hurt) but something for chins and dips. Great story! I really like the stories where fitness is a life long journey. Here is another inspirational guy. I have never seen an outdoor gymnastics park (of course I haven’t traveled much). Are these common in the United States also? I want to find a place like this. thanks again for sharing Ross. Anatoliy looks like the actor Ed Harris 😉 “just sayin”. @Doug…Agreed. Not only bars for dips and pullups but monkey bars too. I used to love using monkey bars and find them to be excellent for the hands, grip, and forearms. You hardly ever see monkey bars anymore, and if you do, the bars aren’t long enough. I feel that using monkey bars are an excellent tool for people not strong enough to do chins and pullups to aid them in attaining that strength. I would say include ropes to climb, but with law suits and all that other pansy caca we have today, you would have to be careful of lawsuits. It’s always someone else’s fault in our sick society nowadays. And yes, I agree with you also on the speedo gear. Must be a European thingy. haha. Awesome, a few years older than me, but I’m still working hard at it. You can take time off when you’re young, but not in your 60’s and 70’s.